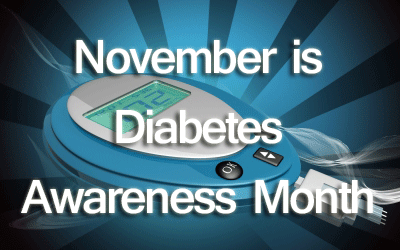 November is Diabetes Awareness and Diabetic Eye Disease Month. This is a great time to get your eyes checked and to learn more about Diabetes, Vision Loss and the four major Diabetic Eye Diseases. Keep reading for our in-depth look. Diabetes can be a terrible disease that if untreated can lead to vision loss and even blindness. Diabetic eye disease is the leading cause of blindness in the United States. In fact, roughly 20% (1 in 5 adults) in a recent study by Prevent Blindness reported knowing someone who had lost their sight or is losing their sight due to diabetes. 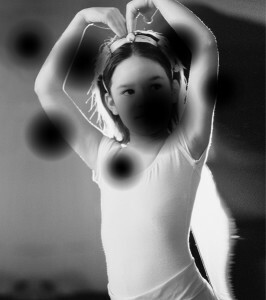 Yet, many diabetics have early stage eye disease and do not even know it. Keep reading to learn more about these diabetic eye diseases, their treatment and prevention, plus some low vision devices to help diabetics who already have vision loss. Whether you have Type 1 or Type 2 diabetes, all diabetics are at risk for developing diabetic eye disease. However, if you are African American, Native American, Hispanic/Latino or elderly your chances of developing diabetic eye disease are even higher. The longer you have diabetes the greater your risk of developing diabetic eye disease and losing your vision. Diabetes affects vision when blood sugar levels are too high. High blood sugar can temporarily cause blurred vision and if sustained, can affect the blood vessels in the retina and lead to more permanent eye damage and vision loss. If you have diabetes and experience any of these symptoms, the best thing you can do is to see your optometrist or eye care professional right away. If you have diabetic eye disease, the longer you wait the greater the chance you will develop permanent vision loss. Diabetes causes vision loss through four major diabetic eye diseases: diabetic retinopathy, diabetic macular edema (DME), cataracts and glaucoma. Diabetic retinopathy is the most common form of diabetic eye disease and is the result of damage to the blood vessels in the retina— the area of light-sensitive tissue at the back of your eyes that helps you see fine detail. Diabetic retinopathy can cause abnormal blood vessels to grow on the retina or existing blood vessels to swell and leak fluid, both of which can lead to vision loss. This is the earliest stage and mildest form of diabetic retinopathy. Mild non-proliferative retinopathy means that you have micro-aneurysms or small balloon-like swelling in the blood vessels of your retina. Moderate non-proliferative retinopathy is more progressive, and at this stage there is blockage to some of the blood vessels to and in the retina. With severe non-proliferative retinopathy even more blood vessels are blocked, and many areas of the retina are cut-off from their blood supply. In order to get the blood the retina needs to flourish, the body is signaled to grow new blood vessels. Proliferative Retinopathy is the most advanced stage of diabetic retinopathy, and although you may still may see fine, you have a high risk of vision loss. Once in the proliferative retinopathy stage, the body grows new (and often weak) blood vessels on the retina and along the surface of the eye’s vitreous gel to get blood to the areas of the retina that are blocked. The thin walls of these abnormal blood vessels can leak causing vision loss or even blindness. Between 40-45% of Americans with diabetes have some form of diabetic retinopathy. There are more than 8 million people living with diabetic retinopathy in the US, and this number is projected to increase to 11 million by 2032. Diabetic Macular Edema, or DME, is caused by swelling (edema) in the eye that comes from fluid leaked into the center of the macula by damaged blood vessels. Macular edema affects your sharp, straight-ahead vision. DME can be symptomless and develop at any stage of diabetic retinopathy, and roughly 50% of people with proliferative retinopathy also have macular edema. Glaucoma is the build-up of pressure in the eye. Glaucoma is often called the “silent thief of sight” because it often has no symptoms, and it slowly steals your vision. If left untreated, glaucoma can make you lose your peripheral or side-vision. Typically, glaucoma affects both eyes. People with diabetes are 40%-50% more likely to develop glaucoma than non-diabetics. Cataracts are a clouding of the lens of the eye that causes reduced or blurred vision. Cataract symptoms of blurred vision are most noticeable when driving at night or in bright sunlight. Cataracts tend to develop as people age; however, people with diabetes are more likely to develop cataracts sooner than non-diabetics, and diabetics are overall 60% more likely to develop cataracts than people without diabetes. Lowering your HbA1c level by just 1% can reduce your risk of developing cataracts by 19%. What can diabetics do to detect and prevent diabetic eye disease and vision loss? Even if you already have some level of diabetic eye disease or diabetes related vision loss, there is still hope. Meeting with your eye doctor or eye care professional is critical for all diabetics to prevent, stop its progression and to treat diabetic eye disease. Visit your eye doctor or eye care professional annually and while you’re there get a full dilated eye exam. Getting regular comprehensive eye exams helps people with prolific diabetic retinopathy decrease their risk of going blind by 95%. Diet has a strong relation to eye health. Eating foods with high saturated fats and sugars can increase your chance of developing diabetic eye disease and make it harder to control blood glucose levels. At the same time, leafy greens, fruits and vegetables may help to prevent eye disease. To keep your eyes healthy, you should eat the rainbow of 5 to 8 servings of dark green or bright colored vegetables and fruits every day. Be very careful of the carbohydrates you eat. Avoid salt and sodium to reduce your risk of cataracts. Eat only whole grains, healthy fats and good sources of protein. Being overweight not only makes treating diabetes more difficult, it also increases your risk of developing diabetic eye disease. Excess weight makes your body more insulin resistant, and it takes more insulin (either by injection or by your body) to move glucose from your bloodstream into your cells. Extra fat changes your body’s natural timing for the rise in blood glucose after eating. Being overweight also reduces the amount of insulin secreted by your pancreas. Having high blood fat and obesity increases your risk of diabetic retinopathy, while Losing weight lowers this risk. Some diabetics can even stop taking diabetes medicine once they have lost weight. The best way to reduce the risk of diabetic vision loss is to maintain a healthy weight. Keeping active is important for everyone, not just diabetics. Exercise helps diabetics to naturally lower blood sugar levels, burn extra calories, maintain a healthy weight, and to improve overall blood pressure and flow of blood throughout the body. All of these benefits help you manage your diabetes and reduce your risk of vision loss. Aim for 30 minutes of exercise and activity every day. High blood sugar damages blood vessels throughout the body, including the eyes. Checking your blood sugar levels consistently throughout the day and keeping them as close to normal as possible can reduce complications from diabetes (including eye disease) by as much as 70%. High blood pressure increases the chance you will suffer vision loss from diabetic retinopathy, especially if you have had diabetes for more than 10 years. It also makes you advance through the stages of retinopathy more quickly. High blood pressure makes it more likely that weak vessels will leak fluid into your eye causing you to lose your vision. A great way to protect your eyes is to keep your blood pressure at a healthy level. Cholesterol affects the lining of your blood vessels and can make diabetic retinopathy much worse. Controlling your cholesterol levels makes your risk of developing diabetic eye disease and other cardiovascular problems much smaller. Shoot for eating less than 300mg of cholesterol a day for optimum eye health. We all know that smoking is not good for you, but did you know that smoking increases your risk of developing diabetic eye disease and suffering from vision loss if you are diabetic? People who smoke have higher blood sugar levels and greater chances of developing diabetic retinopathy and cataracts. 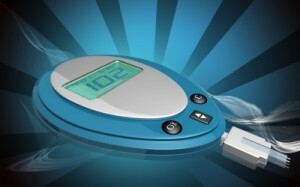 Smokers also do not respond as well to insulin and other treatments. If you are diabetic and worried about eye disease, you should quit smoking as soon as possible. Medicines are always advancing and can be vital in the fight against diabetic eye disease. If your doctor has prescribed a medicine regimen then be sure to follow it as directed to keep your blood sugar, pressure and cholesterol levels in check and to prevent diabetic vision loss. Pregnant women with diabetes have a higher risk of developing diabetic retinopathy. All pregnant women with diabetes should get a dilated eye exam and may even need additional eye exams throughout the course of their pregnancy to prevent vision loss. No treatment is necessary for the first three stages of diabetic retinopathy unless you have diabetic macular edema. The first thing you can do to treat diabetic eye disease is to control your blood sugar, blood pressure and cholesterol levels. Since high levels of blood sugar, pressure and cholesterol are linked to vision loss among diabetics, monitoring and keeping these numbers in balance is your first form of treatment. Other forms of treatment for more advanced diabetic eye disease include medications, laser surgery or eye surgery such as victretomy. In some cases, medicine may be effective in treating diabetic eye disease or preventing further vision loss. Your eye doctor may prescribe you steroid or anti-VEGF medication (which helps block the growth of abnormal blood vessels). Common medicines used in treating diabetic eye disease include Lucentis, Avastin, and Aylea. Consult your ophthalmologist or eye care professional to learn more about the medicines available to treat diabetic eye disease. Laser eye surgery can reduce the risk of blindness due to diabetic eye disease by 90%, but it cannot restore vision already lost due to diabetic eye disease. There are two types of laser eye surgery depending on you type of diabetic eye disease: scatter and focal laser surgery. Scatter laser surgery (panretinal photocoagulation) is used for proliferative diabetic retinopathy. Scatter laser treatment can shrink abnormal blood vessels using tiny burns. 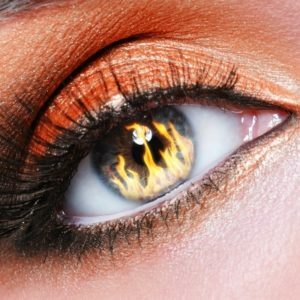 During this treatment your eye care professional will make 1,000 to 2,000 tiny scattered laser burns to the retina away from the macula. Panretinal photocoagulation typically takes at least two sessions to complete. Scatter laser surgery may cause some loss of side, color and/or night vision, but it can also save your remaining sight. Focal laser surgery, also called photocoagulation, is used to treat diabetic macular edema and occasionally for glaucoma. During photocoagulation a laser is used to make more than 100 tiny burns on the retina to seal blood vessels and stop them from growing or leaking fluid. This procedure is typically done in a single day although it is only done on one eye at a time so you may need to two visits if both eyes are affected. Focal laser surgery stabilizes vision, reduces vision loss by 50% and in rare cases can even slightly improve vision. Eye surgery (beyond laser surgery) can be effective in treating diabetic vision loss. Common eye surgeries include a vitrectomy and cataract surgery. A Victrectomy, often used to treat proliferative diabetic retinopathy, removes the blood leaked into the center of your eye and helps improve lost vision. The center of your eyes are filled with fluid called vitreous gel. When blood vessels weaken and leak fluid or blood in the eyes, it causes vision loss. This vision loss can be reduced by a victrectomy. During a victrectomy, a doctor makes a small incision into your eye, takes out the clouded vitreous gel and replaces it with saline solution. Cataract surgery is quite common and often recommended to improve vision. During cataract surgery the lens of the eye is removed and replaced with an artificial one. Diabetics who undergo cataract surgery may experience their retinopathy getting worse and even the development of glaucoma. If you are a diabetic considering cataract surgery, ask your ophthalmologist for more information. If you have already lost some or all of your vision due to diabetic eye disease, you are not alone, and there is help. There are low vision specialists who offer counselling, training and special services. Further, there are many low vision devices that can help you optimized your remaining sight to live a more full and independent life. 3-in-1 Video Magnifiers (also called CCTVs) are highly recommended for diabetics with vision loss. Two popular examples include the Acrobat Mini HD and the DaVinci. These are both good for diabetics for many reasons. 3-in-1 video magnifiers have twistable cameras that allow you to see near, far and everywhere in between. This twistable camera allows you to move it to see skin discolorations on your body, including on your hard to see your legs and toes. The high powered camera on your video magnifier enables you to more easily see insulin meters for measurements. 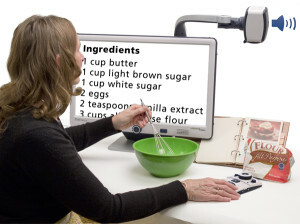 These cameras can also help you to read food labels and recipes to help with diabetic nutrition. They even help you to read prescription label information. Both the DaVinci and the Acrobat Mini HD video magnifiers have a high lens clearance so you can easily get your hands in under the camera to handle your insulin needles. The high lens clearance means you can fit prescription bottles, or even food containers such as cereal boxes to read nutritional labels. Diabetes is a disease that affects all of us whether we have it or not. Diabetes can steal your sight, but knowing more about diabetic eye disease, and the steps you can take to prevent and treat diabetic vision loss can help you keep your vision. If this article has helped you, please share it with others and let’s all do what we can to spread diabetes awareness. New England Low Vision and Blindness is proud provider of low vision products, blindness aids, software solutions and training services for visually impaired people with diabetes. To learn more about our full suite of low vision and blindness products and training services to support diabetics click here.